A foreclosure sale is the conclusion of a legal proceeding whereby a mortgagee induces the sale of real or personal property of a mortgagor to satisfy a delinquent note. The process is often--although not always--adjudicated by the courts, and is dependent upon guidelines set by the laws of individual states. While regulations vary state to state, safeguards generally exist to assure that both the lender and borrower are treated equitably and in accordance with state law and the terms of the individual contract. If, however, a borrower is found to be in default of his note for nonpayment or payments that are seriously in arrears, the lender can initiate foreclosure proceedings. Depending on the state, the entire process can take from one month to over a year. For judicial foreclosures, the mortgagee must first prove that the mortgagor is in default of the note. The mortgagee usually notifies the mortgagor when he is late on his payment(s). Failing to receive a response after an earnest effort to work directly with the borrower to collect the debt, the mortgagee often turns next to an attorney. The attorney also urges the mortgagor to honor the terms of his contract. If the attorney's involvement still does not garner a positive response, the attorney can file a motion with the courts to initiate foreclosure proceedings. If evidence is sufficient and the motion is granted, the process continues to the stage of sale publication. Public notice of a foreclosure sale, through legal notices in area newspapers, is given of the impending sale. Specific terms of notification depend on the state, but the intent is to notify anyone with an interest in the person or the property that legal action is imminent. The foreclosure sale is conducted by a licensed auctioneer and is open to qualifying members of the public. If at any time during the proceedings, right up until the date and hour of the sale, the mortgagor is able to pay off his debt, he can stop the foreclosure from moving forward. Also, many states allow for a redemption period whereby a mortgagor can get back his property even after a foreclosure. 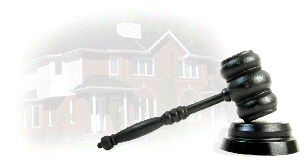 If you attend a foreclosure auction sale, you should check out the laws of the property's state. Among the many things you will want to consider are: the amount of deposit required and whether or not it is nonrefundable; when you will be expected to close on the property; whether or not the property is being sold "absolute" (no minimum bid) or with reserve; what existing liens are on the property; whether you will be allowed on the property prior to the auction (for most foreclosure proceedings, the mortgagor is the owner of record on the property until after the foreclosure and has the right to bar trespassers from his property); whether the new owner will be required to honor tenant leases; and what, if any, is the redemption period in the state. Many states have specific laws to protect members of the military on active duty from undergoing a foreclosure proceeding.